The construction of new office buildings and Budapest’s soaring office market is a popular topic these days. However, companies looking for an office in Budapest face a serious challenge. The most recent analysis of the Budapest Real Estate Advisory Forum (BRF) for the third quarter of 2017 has been published, and the summary suggests that the Budapest office market will continue to flourish - at least from a proprietary point of view. In the third quarter of 2017, 6,500 square meters of new office space was handed over to increase the volume of the Budapest office market, including the 2500 square meters of the Graphisoft Park Start-up building as well as the pearl of the Váci corridor, the 4,000 square meter office space of the Nexon headquarters. Zoltán Gyöngyösi, managing director of the TCL Group , calls attention to the continuous and dynamic expansion of the Budapest office market, stating, "There are significant investments in many parts of the city such as in the Váci corridor, but there are currently several major investments in the Buda side of the city as well." He also emphasized that these buildings are made to conform to high international standards of quality. Although this sounds promising, new offices remain difficult to find in short or even reasonable timeframes. According to BRF's analysis, total office space rose to 3,353,235 square meters, of which only 7.6% is vacant. This vacancy rate is Budapest’s lowest yet. The highest rate is found in the city’s outskirts (28.5%) while the lowest is in South Buda (3.3%). This, in turn, means that despite the investments, it is still a difficult situation for those looking for quality offices in Budapest today, as demand has skyrocketed. This year’s office demand is 67% higher than the same period last year. 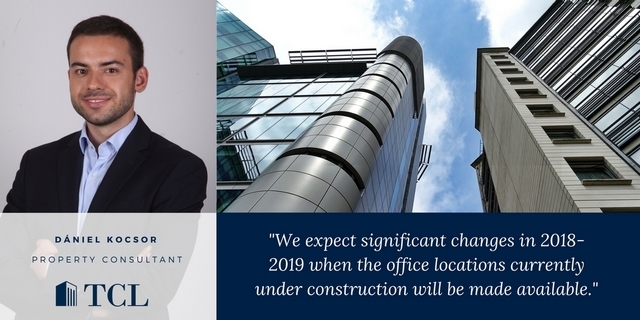 Dániel Kocsor, TCL Group's office market consultant, believes that due to large office investments as a result of the crisis and due to the ever-increasing demand, office buildings are now saturated, resulting in considerably lower supply compared to previous years. "In this area, we expect significant changes in 2018-2019 when the office locations currently under construction will be made available." Until the opening of the new office buildings, however, the companies looking for an office space in Budapest are in a difficult position. Since the present situation favours office owners, it is difficult to find a good bargain without extensive knowledge of the market. In addition, many of the locations under construction will have already been contracted out before completion of construction. However simple renting an office may appear, complex market realities may necessitate contracting with a tenant representation consulting firm with professional experience and up-to-date knowledge on the office market in Budapest. The situation is especially difficult for companies that cannot or do not want to commit themselves long term to renting out hundreds of square meters. While large corporations may be able to build office buildings or rent on a large scale, smaller companies have virtually two choices. "Some move to newly refurbished, high-quality residential offices that meet their technological requirements. Other businesses that are in need of full-fledged office-based services so that the entire staff can concentrate on substantive work typically choose to move to serviced office centres in Budapest . At these office centres, companies can rent fully-equipped offices, which are available for use without any initial costs immediately after signing the lease. The businesses can start work almost immediately," says Zoltán Gyöngyösi.